Adrenaclick, a similar epinephrine auto-injecting device, now available nationwide at CVS pharmacies. CVS Pharmacy announced January 12, 2016 that they have partnered with Impax Laboratories to market a generic epinephrine auto-injector for $109.99 for a two-pak. This is much less then Mylan’s Epipen two-pack prices, which list for more than $600 as a brand name and $300 as a generic. The price is similar to that of EpiPen’s before Mylan bought the rights to the life-saving devices back in 2007 and raised the price repeatedly and dramatically. This is still expensive for a medication that costs pennies to produce. The price of $109.99 for the alternative applies to those with and without insurance, CVS noted. And Impax is also offering a coupon to reduce the cost to just $9.99 for qualifying patients. Meanwhile, backlash to Mylan’s price hikes continue. This week, Cigna, a top health insurance company, said that it will no longer cover Mylan’s brand name EpiPen—it will only cover the generic, which was rolled out in December. The rest of the committee was equally disgusted, but the hearing still dragged on for nearly six-and-a-half hours into the late evening Wednesday. Throughout, Congress members on both sides of the aisle grilled and chastised Heather Bresch, CEO of Mylan Inc., maker of EpiPens. With only one small competitor, Mylan holds 90 percent of the market share on epinephrine auto-injectors, which reverse deadly allergic reactions. Since buying the EpiPen in 2007, the company has raised the price 15 times, totaling a 500-percent increase. EpiPens went from roughly $50 each to $608 for a pack of two. But Bresch didn’t wither under the harsh scrutiny; rather, she defended the company’s pricing, even stating on several occasions that she “could not be more proud” of Mylan’s work. In her testimony and responses, Bresch painted the company as humanitarian, committed to educating consumers about deadly allergic reactions and the need for epinephrine auto-injectors to be stocked in schools and other public places. She also blamed the complexities of the American healthcare system on obfuscating drug pricing and argued that the EpiPen has not been the cash cow it appears to be. She testified that the company only makes a measly $50 in profit from each pen. 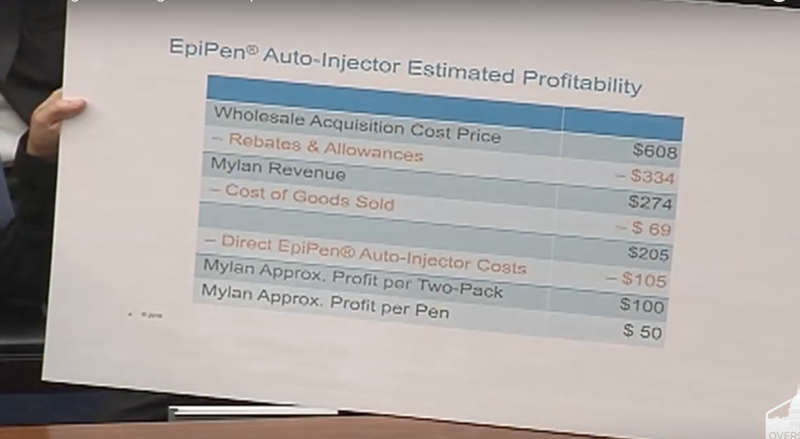 The chart shows how a $608 EpiPen two-pack breaks down to only a $100 profit (or $50 per pen) for Mylan. After rebates and discounts to pharmaceutical managers and suppliers, Mylan brings in an average of $274 per two-pack, according to Bresch. She reported that the company sells 4 million two-packs a year, which would make the revenue about $1.1 billion. But after Mylan pays its manufacturing partner ($69 per two-pack) and covers undefined costs ($105), only $50 per pen is left as profit. Other committee members laid equal blame at the Food and Drug Administration for potentially holding up competitors’ auto-injectors with lengthy product approval processes. Also testifying before the committee on Wednesday was Doug Throckmorton, deputy director of the Center for Drug Evaluation and Research at the FDA. Throckmorton admitted that 2,300 products are now in line to get reviewed by the agency, but he noted commercial confidentiality laws kept him from revealing if any of those applications were for an auto-injector. However, Throckmorton noted that the agency has openly encouraged companies to submit an application for a generic or a competitor and would keep the approval process under 10 months for any that come in. Meanwhile several pieces of legislation have been proposed to prevent or at least shed more light on the drug price increases. These include bipartisan legislation sponsored by US Senators John McCain (R-Ariz.) and Tammy Baldwin (D-Wisc.) released last week that would require drug makers to notify the government a month in advance of any price increases greater than 10 percent and to give a justification for the increase.